Hand stamped VW heart keychain tag just in time for Valentine's day! Perfect gift for any VDub lover. Tell us what you want stamped on the tag in note to seller when you place your order. 1-3 shorter words fit best or 1 longer 1-7 letter word. The font is newsprint in capital and lower case, if you want all caps words will have to be short. We also have numbers, most symbols, a heart stamp. You can also choose to have the ring punched through the corner or center of the heart. 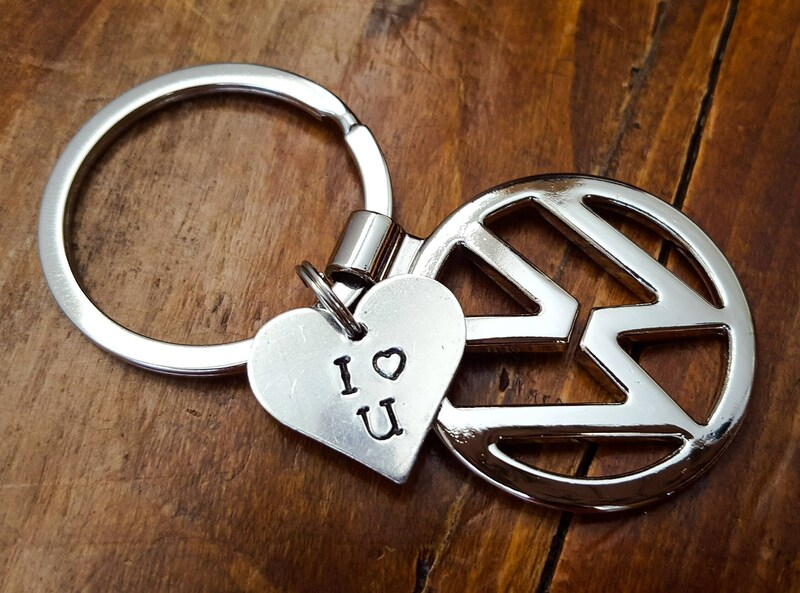 Your purchase includes the custom heart shaped metal tag, small split ring, keyring, and VW emblem keychain, all for $10. You can also add an additional tag for $5 extra. We try to ship these out 1-3 days after you place your order.